When you look up-and-down pit row at an H1 Unlimited hydroplane race you see one man that has been a fixture in the pits for decades. In fact, he began gathering his affluence in hydro racing in the 1960s as a crew member. By the '70s his wealth of knowledge was rewarded as he became a crew chief. In the '80s and '90s the man with decades of racing knowledge became a boat owner. Today, the icon of the sport has a new moniker to add to his hydroplane title after Jane and Billy Schumacher announced they have hired one of the sport's most knowledgeable legends, Jim Harvey as General Manager for Schumacher Racing. General Manager will be Harvey's biggest task in his hydroplane career. Charged with overseeing the building of the state-of-the-art U-37 Schumacher Racing hydroplane at Ron Jones Jr.'s Three Point Composites in Pacific, Wash. facility and teacher to the Schumacher Racing crew. Harvey said, "This is a huge project. Getting two boats ready for the season, one from scratch and one that needs to be fixed is monumental task." But for Harvey this is nothing new. He has built from scratch or completely rebuilt 15 hydroplanes in his 45-year career he is not running from the project. Harvey had owned an unlimited hydroplane for nineteen seasons winning five races as an owner. He has also severed as a crew chief eight years, spearheading several victories including multiple A.P.B.A. Gold Cups and national championships. In his early career served as a crewman for over a decade. Co-owner Billy Schumacher said, "Jim (Harvey) has built and overseen the building of many unlimited hydroplanes in his career. You can take everyone else in the sport today that have built boats and add them together and it still would not match Jim's experience." Schumacher continued, "Jim knows boats and he knows how to build boats, plain and simple." In order to meet the completion deadline for the new boat, Harvey has become the ring-master of sorts, ordering custom hardware weeks in advance and splitting his time between the two boat shops 40 miles apart. "You have to be always looking forward," Harvey said about his new role. You have to know what parts are in production, you need to know when you need certain parts, when they will be completed, and when they need to be installed on the new boat all while staying on budget." For Harvey building a new boat is like rebuilding one of the estimated 450 Rolls Royce Marlins he rebuilt in his early days of racing. "There are no manuals; you just know where the parts go and what their torque specs are. It's the same as building boats, there are no manuals or directions on how to do this," He smiled and said he bets people wish he would write one. After a freak ladder accident last year at the San Diego race where he broke his neck, right arm and left wrist Harvey contemplated his future in the sport or whether he should retire for good and ride off into the sunset on his Harley Davidson. "This challenge was too great of an opportunity to pass up," Harvey said. "This is a very rewarding project. Billy (Schumacher) is a former driver. He is a real racer and a good businessman and knows what is needed and that's were blend. His goals and dreams are the same as mine." Harvey said he would like to win races the first year with the new boat and eventually win the Gold Cup and National Championship like he did when he teamed with then driver Chip Hanauer in the Atlas Van Lines. "These are all goals I have achieved before, but this time I want to achieve these goals for other people within this organization." He said he is running hard, "some days my feet don't touch the ground but this is my career." Harvey summarized his new role simply, "I have been to the top and now I want to go back and show others the way." Harvey began in hydroplanes in 1966 when the front of the race boats were round, had open cockpits and threw out a tremendous amount of noise and horsepower with mammoth V-12 motors. His first job was with the U-88 Hilton hy-per lube, the boat was only sparsely competitive, but was a first class professional operation. After active duty in the Vietnam War as a radar man, Harvey returned to boat racing in 1972 with the Miss Timex team based in Owensboro, Ky. By season's end he had gained so much respect from his team and fellow racers voted Harvey "Crew Member of the Year." The following year, aching to return to the Pacific Northwest Harvey returned and worked for two Seattle based teams, the U-16 Valu-Mart and the U-7 Notre Dame. In 1975 Bernie Little hired Harvey to crew on the Miss Budweiser. In 1976-77 he took those years off from professional boat racing to begin a family. He has one son (Camron) and two daughters (Megan & Kezia). Harvey's crew chief break came in 1978 when a couple Nevada casino operators decided to use hydroplane racing as means of advertising their casinos –- Circus Circus. After a few races in an older race boat, the owners decided to build a new race boat for the '79 season. The Harvey led crew built a new boat and by seasons end had placed second in the National High Points Championship. The boat had qualified fastest at four out of nine races, set a world record and won its first race. Not since 1966 had a new team won a race with a new race boat in the first season. The cantankerous owners at Circus Circus broke the crew up after the '79 season. Harvey found himself down the Interstate highway at Bill Muncey's Atlas Van Lines race team. From 1980-1983 while at Atlas, Harvey was involved with the team winning multiple races and again oversaw the building of a new race boat. In 1984 the team sold the boat to Bob Steil of Squire Shop stores fame and Harvey went with the race boat. Harvey remained for three seasons. Harvey became a boat owner in 1987 when an opportunity to purchase the Squire Shop hull he helped build a handful of years earlier. He quickly landed Oh Boy! 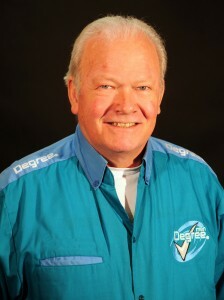 Oberto as his sponsor and selected a rookie driver, George Woods Jr. as his driver. In his first years as owner, Harvey had to overcome many obstacles including his transport truck, motors and tools being destroyed in fire on its way to the first race. In 1988, Harvey got his first and second win as an owner when his piston-powered hydroplane won both salt water races over the then salt water sensitive turbine powered challengers. In 1990 Harvey made the decision to switch the hull to turbine power rebuilding many of the boats systems to accommodate the change in power-plants. In 1992, after a couple year learning curve with the new turbine power Harvey and crew decide to re-build a new radically designed boat designed by Ron Jones Sr. sponsors gear box modern time turbine boat. After winning the first race of the season with the old boat, Harvey decided to race the new boat mid-season. The new boat showed potential and won the last race of the season. Harvey's forth win as an owner. In 1995 Harvey picked up his fifth and final win as an owner when Steve David drove the Miss T-Plus to victory on Kansas City's Smithville Lake. In 2001 Harvey began another new boat project with the help of veteran unlimited crew chief Ron Brown. He would race the new boat from 2002-2005 and retired from being a boat owner in 2006. Since selling his team Harvey has been an advisor to several race teams and in 2009-10 he worked with Fred Leland's U-100 and spent the last three races of the season putting the U-57 Formulaboats.com together making it race ready.